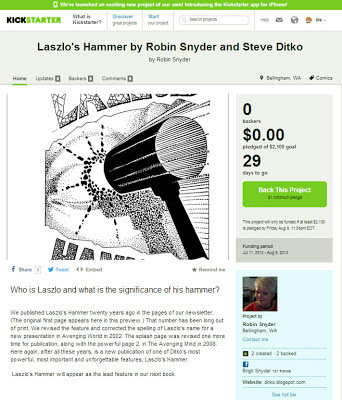 Robin Snyder has a new Kickstarter project for a new edition of Ditko's 1992 LASZLO'S HAMMER, long out-of-print as a separate publication and only available as part of the larger AVENGING WORLD book. The description says that " Laszlo's Hammer will appear as the lead feature" in this book, so presumably some other reprint or new Ditko will make up the balance of the book. Here's the Ditko-Fever entry for the original publication, which is one of the few major Ditko publications I've never even seen a copy of, much less own.